The City of San Jose has allotted $4 million to conduct an economic and technical evaluation of PRT for San Jose Airport and surrounding destinations, and then will work with a PRT vendor to implement PRT. A Boston Globe article explains more: October 2009 Globe news story. 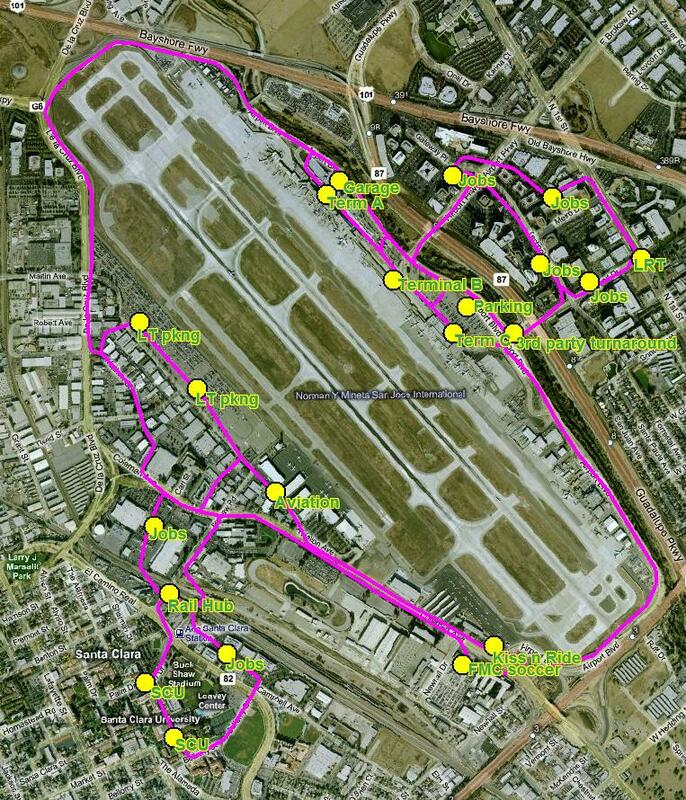 The proposed San Jose Airport PRT network. In September of 2008, the City of San Jose issued a Request for Interest for an Automated Guideway (PRT) system for San Jose Airport. On the right is a sketch alignment of a PRT system (12.6 mi, 21 station, $189M estimated capital costs) for San Jose Airport and surrounding activities. Working as circulator transit for office parks, airports, universities and other major activity centers, ULTra PRT provides a congestion free mode of transport which also makes carpooling and other transit more effective by solving the “last mile problem.” In addition, PRT enables longer bike commutes and shopping trips, offering added flexibility to both residents and visitors. KGO TV covered the story: Laura Stuchinksy is a sustainability officer for San Jose’s Department of Transportation. She and other city officials are considering the idea of having such a public pod system link the Mineta San Jose International Airport with area businesses, hotels and other nearby transit options, like Caltrain, BART and the VTA Light Rail. “One of the advantages of this automated transit network is that it offers a lot of flexibility. It’s much less expensive than traditional transit. It doesn’t serve the same needs as high-speed rail or BART. It’s a complement to those systems,” said Stuchinsky. The city is in the exploratory stages of a public-private partnership, reviewing proposals from 18 companies from Silicon Valley and around the world. A four-person pod would travel on elevated guide-ways, about 15-feet above the ground.